Today Mercedes-Benz FashionWeek Amsterdam announces the Catwalk Program for its ten year anniversary edition. 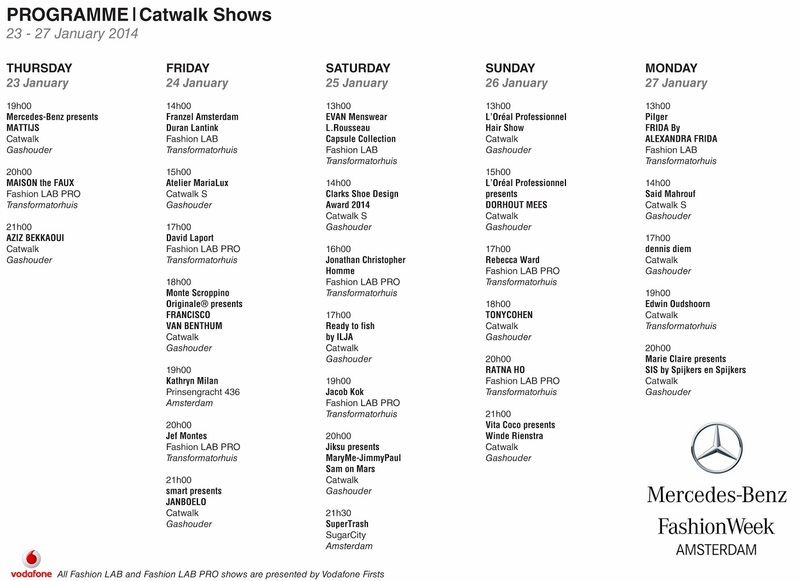 From 23 to 27 January 2014 established names, emerging designers and new labels will show their A/W ’14 collections to international fashion professioanls and the fashion public. Together they show a cross section of Dutch fashion. The program includes established names such as Mattijs van Bergen, Aziz Bekkaoui, Francisco van Benthum, Spijkers & Spijkers, Ilja Visser, Jan Boelo and Dennis Diem, emerging designers such as MaryMe JimmyPaul, Winde Rienstra and Dorhout Mees, as well as yet to be discovered labels such as Maison Faux, Atelier MariaLux, David Laport, Jef Montes and Ratna Ho. Carlo Wijnands, Mercedes-Benz FashionWeek Amsterdam’s programme director: "Once again we have succeeded in drawing up a catwalk programme comprising a large number of creative and confident labels that fit well with the outspoken character of Mercedes-Benz Fashion Week Amsterdam. Together they show a cross section of Dutch fashion, our identity and our society. That is why there is increasing enthusiasm amongst commercial parties to connect with fashion. This is important not only for Dutch fashion designers, but also for the fashion industry as a whole." Fashion public spoilt with livestreaming, admission tickets and ten days ‘Downtown’ All the catwalk shows in the 20th edition of the fashion week can be followed live via the FashionWeek Nederland App (available from January 2014) and via www.fashionweek.nl. In addition, it is also possible for fashion lovers to attend the catwalk shows in person and to taste the atmosphere at the Westergasterrein. From today, following application for free membership to the Frontrow Club, they can order admission tickets via www.fashionweek.nl. Additionally, to mark Mercedes-Benz FashionWeek Amsterdam’s ten year anniversary, the fashion public will be treated for ten days to ten public events at ten cultural locations in Amsterdam. This ‘Downtown Programme’ starts on 18 January.